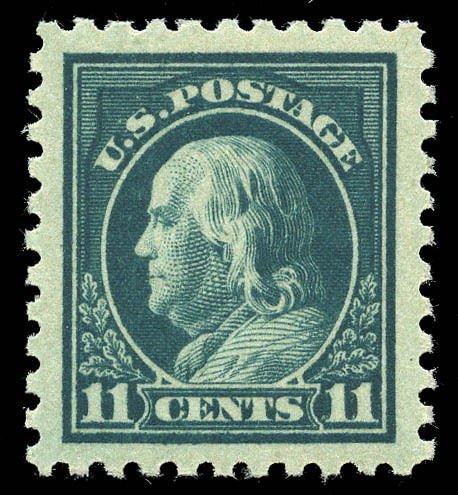 1916, 1¢ green (462), original gum never hinged, virtually perfectly centered, prooflike color. Superb, only seven others at this grade and only four higher. SMQ $850. 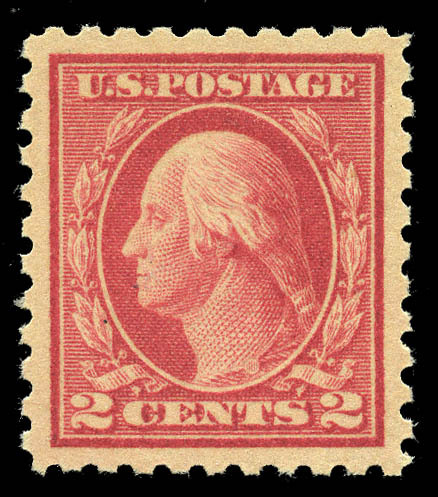 1916, 2¢ carmine (463), original gum never hinged, perfectly centered in wide margins, bright color. Superb. SMQ $525. Expertization: with 2000 P.F. certificate and 2004 PSE certificate, latter graded SUP 98. 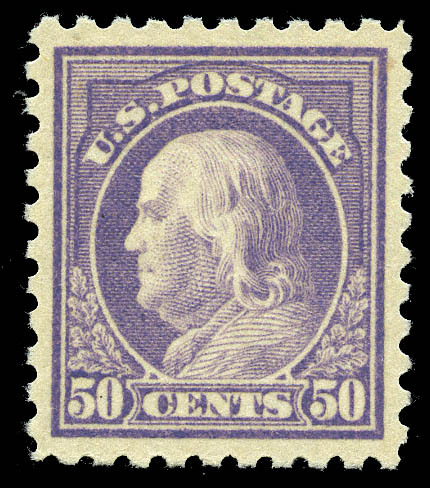 1916, 3¢ violet (464), original gum never hinged, essentially perfect centering, bright color. Superb. SMQ $3,250. A PERFECT LITTLE GEM AND THE HIGHEST GRADED, WITH ONLY ONE OTHER IN THIS TOP GRADE. Expertization: with 1999, 2013 P.S.E. certificates, the latter graded SUP 98. 1916, 4¢ orange brown (465), original gum never hinged, mathematical centering within lavish margins, stunning color. Superb. SMQ $2,500. AN OUTSTANDING JUMBO MINT SINGLE, THE ONLY ONE IN THIS GRADE AND ONLY ONE HIGHER (100). Expertization: with 1999 P.F. certificate and 2006 P.S.E. certificate, the latter graded SUP 98J. 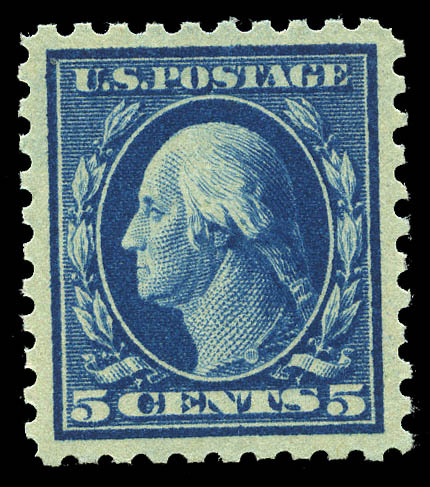 1916, 5¢ blue (466), original gum never hinged, virtually perfectly centered, intense color. Superb. SMQ $3,950. 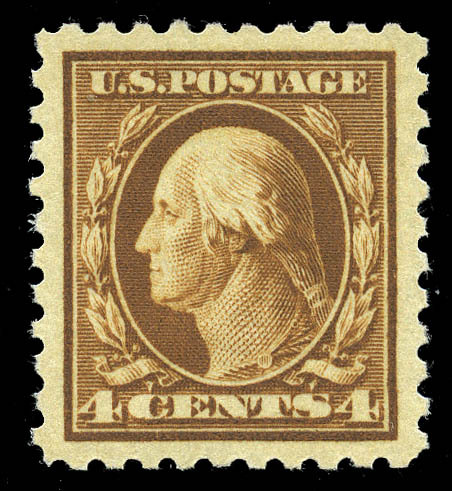 A GEM 5¢ 1916 ISSUE AT THE HIGHEST GRADE WHICH IS SHARED BY ONLY THREE OTHERS. 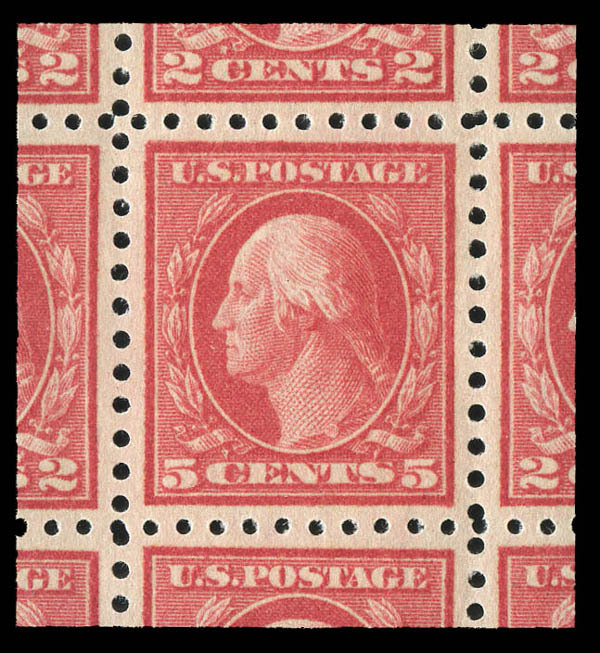 1916, 5¢ carmine error (467), original gum never hinged, surrounded by parts of the eight surrounding stamps, perfectly centered and perfectly balanced, impeccably fresh. Superb. SMQ $12,000. A STUNNING AND EYE-CATCHING GEM, ONLY ONE HAS GRADED HIGHER AND ONLY THREE OTHERS ARE AT THIS GRADE. 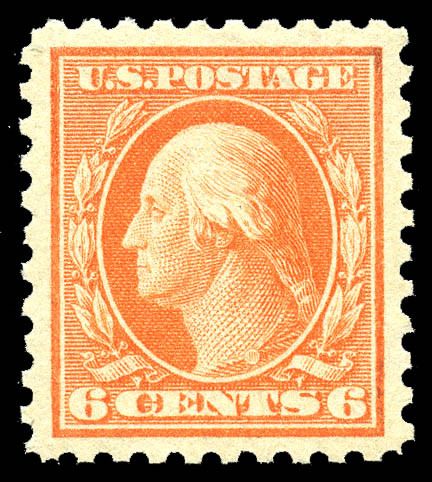 1916, 6¢ red orange (468), original gum never hinged, perfectly centered, brilliant color. A Superb gem. SMQ $3,750. A BEAUTIFUL STAMP AT THE HIGHEST GRADE, SHARED BY ONLY THREE OTHERS. 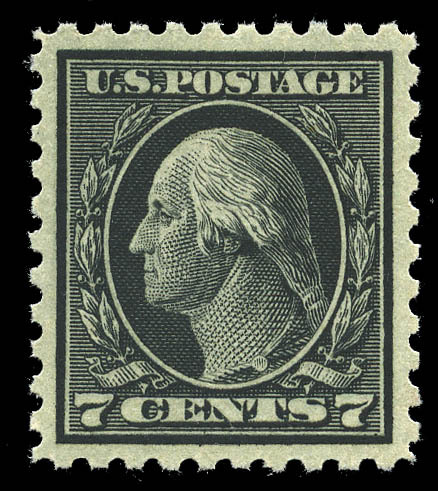 1916, 7¢ black (469), original gum never hinged, flawless centering, intense color on bright paper. Superb. SMQ $4,250. A SIMPLY STUNNING 7¢ 1916, ONLY THREE OTHERS SHARE THIS GRADE AND ONLY ONE IS HIGHER (98J). 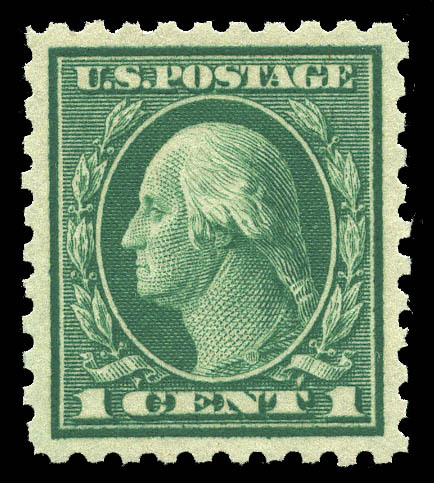 1916, 8¢ olive green (470), original gum never hinged, flawlessly centered in large balanced margins, brilliant color. A Superb jumbo. SMQ $3,300. A GEM 8¢ 1916 WITH GREAT EYE APPEAL— THE HIGHEST GRADED AND THAT DISTINCTION IS SHARED WITH ONLY ONE OTHER. Expertization: with 1995 P.F. certificate and 2008 P.S.E. certificate, the latter graded SUP 98J. 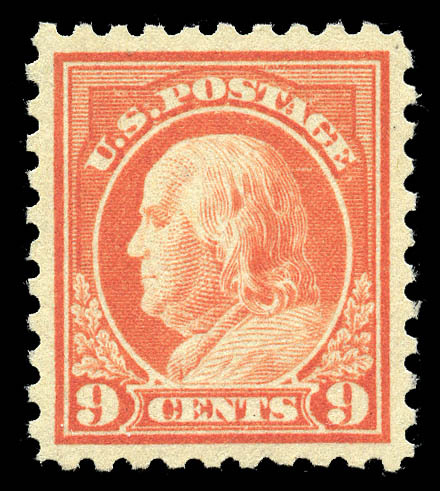 1916, 9¢ salmon red (471), original gum never hinged, perfectly centered, vibrant color. Superb. SMQ $2,350. A BEAUTIFUL 9¢ 1916 WITH ONLY FIVE OTHERS AT THIS GRADE AND ONLY ONE HIGHER (98J). 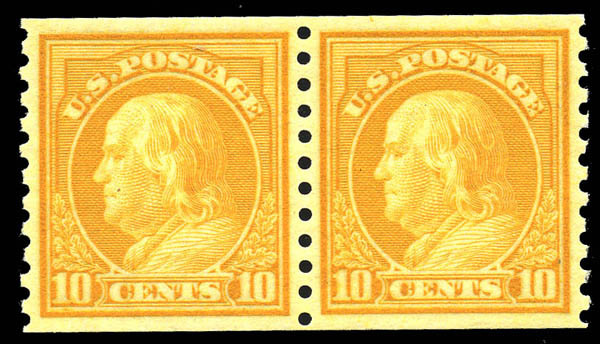 1916, 10¢ orange yellow (472), original gum never hinged, perfect centering, positively glowing color. Superb. SMQ $4,250. A BRILLIANT GEM WITH ONLY ONE OTHER AT THIS GRADE AND ONLY TWO HIGHER (98J, 100). Expertization: with 1999 P.F. certificate (as sheet margin single) and 2007 P.S.E. certificate, the latter graded SUP 98. 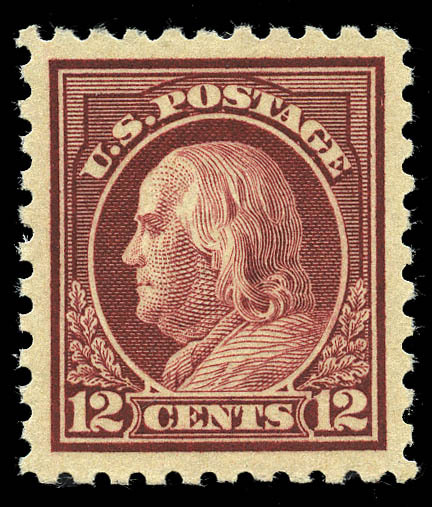 1916, 12¢ claret brown (474), original gum never hinged, perfectly centered in large balanced margins, brilliant color. Superb. SMQ $4,250. AN ABSOLUTELY SUPERB GEM, THE HIGHEST GRADED MINT SINGLE AND THE SOLE EXAMPLE OF THIS TOP GRADE. Expertization: with 2007 P.S.E. certificate graded SUP 98J. 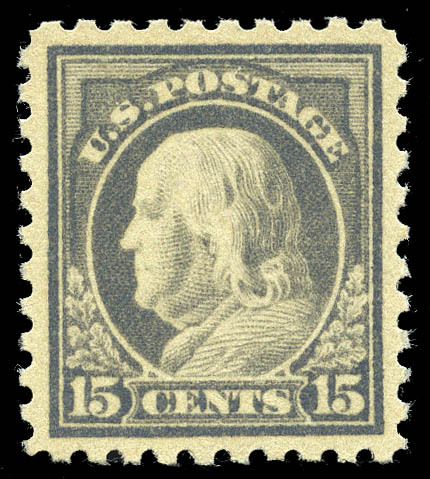 1916, 15¢ gray (475), original gum never hinged, virtually perfectly centered, luminous color. Superb. SMQ $7,000. A GEM 15¢ 1916 IN THE HIGHEST GRADE AWARDED, WITH ONLY FIVE OTHERS SHARING THIS TOP GRADE. 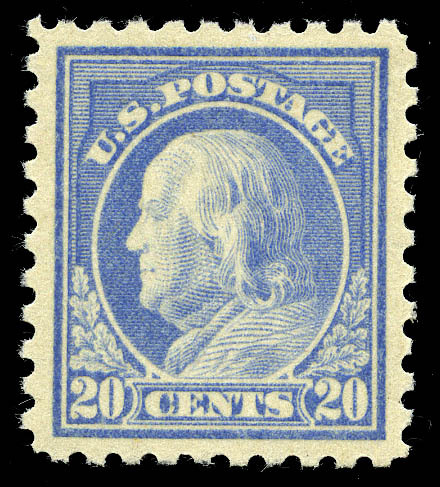 1916, 20¢ light ultramarine (476), original gum never hinged, perfectly centered, wide margins, brilliant color. Superb. SMQ $8,000. A SUPERB EXAMPLE OF THE DIFFICULT 20¢ 1916 WITH ONLY FIVE OTHERS AT THIS GRADE AND ONLY ONE HIGHER (98J). 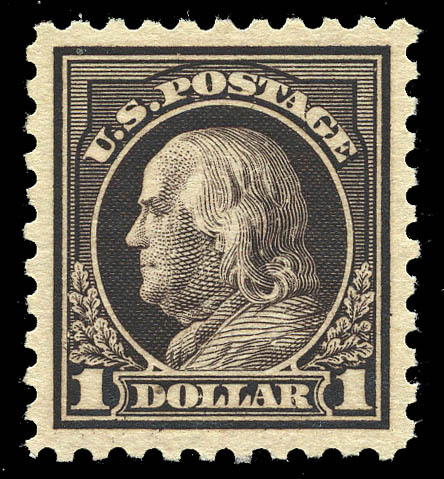 1916, $1 violet black (478), original gum never hinged, flawlessly centered in wide margins, intense shade. Superb. SMQ $16,000. A MARVELOUS GEM EXAMPLE OF THIS HIGH VALUE WITH THE HIGHEST GRADE AWARDED AND WHICH IS SHARED WITH ONLY ONE OTHER MINT SINGLE. Expertization: with 1987 P.F. certificate and 2007 P.S.E. certificate, the latter graded SUP 98. 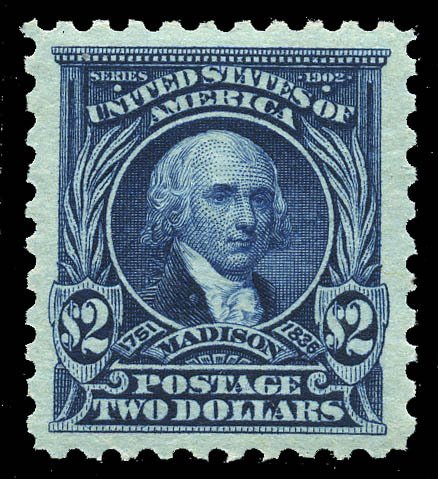 1917, $2 dark blue (479), original gum never hinged, perfectly centered, large margins, full perforations, brilliant color. Simply Superb. SMQ $2,800. A MARVELOUS GEM WITH GREAT EYE APPEAL, ONLY ONE HAS GRADED HIGHER (100). 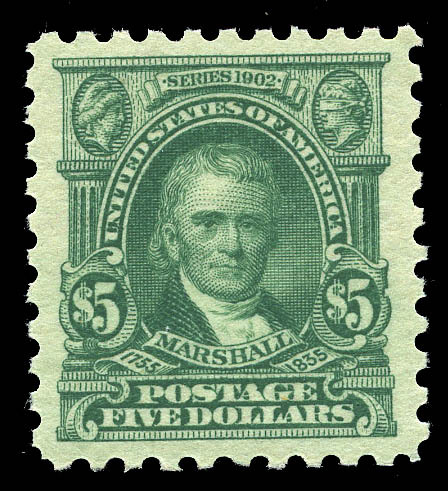 1917, $5 light green (480), original gum never hinged, impeccable centering within oversized margins, rich color. An Extremely Fine jumbo. SMQ $1,850. Expertization: with 2006 P.S.E. certificate graded XF-SUP 95J. 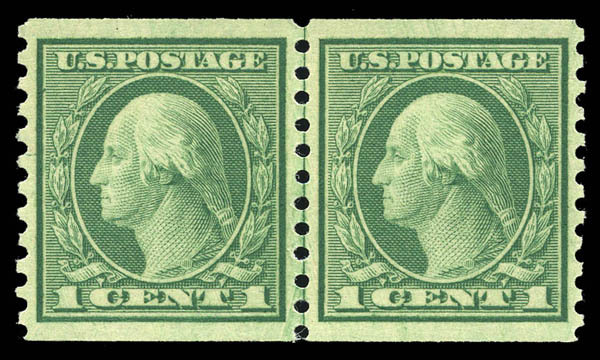 1918, 1¢ green, vertical coil (486), joint line pair, original gum never hinged, perfectly centered and fresh. Superb, highest grade awarded with only three others at this grade. SMQ $300. 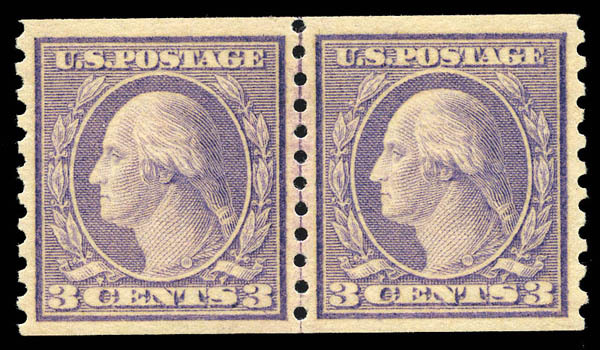 1917, 3¢ violet, vertical coil (489), pair, original gum never hinged, perfectly centered, pretty color. Superb, the highest graded pair and the sole example of this top grade. SMQ $700. 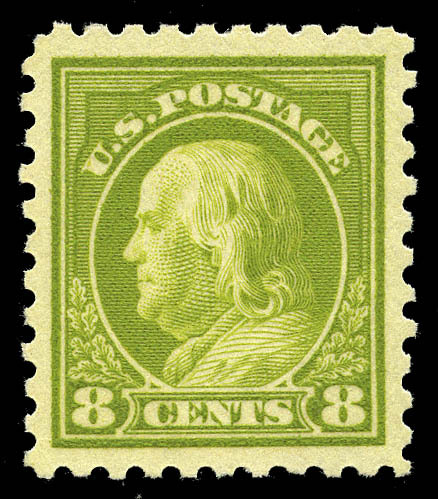 1916, 1¢ green, horizontal coil (490), joint line pair, original gum never hinged, virtually perfectly centered, post office fresh. Superb, the highest grade awarded and share with only three others. SMQ $350. Expertization: with 2004 P.S.E. certificate graded SUP 98. 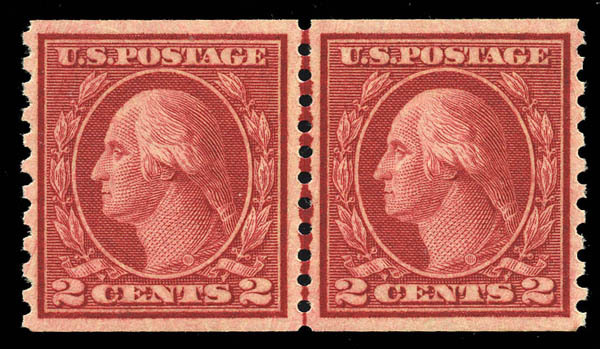 1916, 2¢ carmine, type III, horizontal coil (492), joint line pair, original gum never hinged, perfectly centered, unusually rich color (see PF certificate). Extremely Fine, the highest graded with seven others at this grade. SMQ $500. Expertization: with 2004 P.F. certificate (as "Dark" carmine) and 2005 P.S.E. certificate, the latter graded XF-SUP 95. 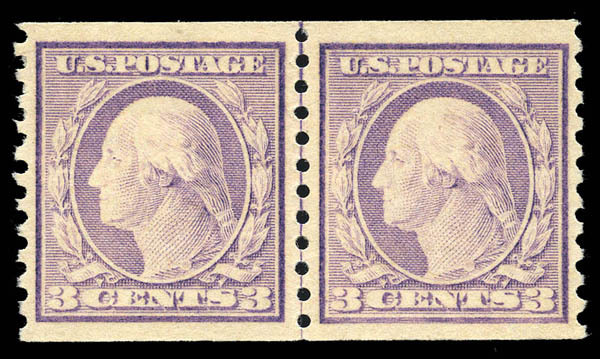 1917, 3¢ violet, type I, horizontal coil (493), joint line pair, original gum never hinged, perfectly centered with huge top and bottom margins, pretty pastel shade. Superb. SMQ $2,400. A MOST IMPRESSIVE LARGE MARGINED LINE PAIR, THE HIGHEST GRADED AND THE SOLE EXAMPLE AT THIS TOP GRADE. Expertization: with 1996 P.F. certificate and 2007 P.S.E. certificate, the latter graded SUP 98J. 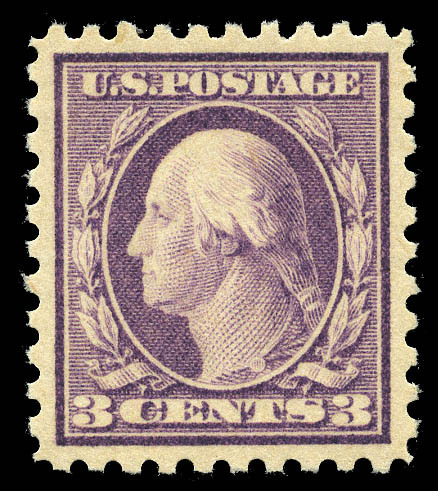 1918, 3¢ violet, type II, horizontal coil (494), joint line pair, original gum never hinged, beautifully centered, bright and fresh. Extremely Fine, the highest graded and the sole example at this grade. SMQ $625. Expertization: with 2004 P.F. certificate and 2005 PSE certificate, latter graded XF-SUP 95. 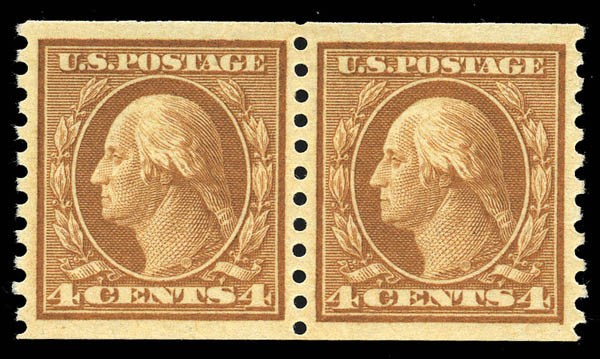 1917, 4¢ orange brown, horizontal coil (495), pair, original gum never hinged, perfectly centered, wide margins, great color. Superb. SMQ $475. 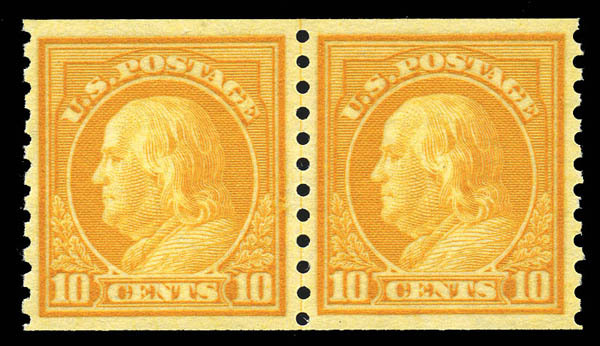 1922, 10¢ orange yellow, horizontal coil (497), pair, original gum never hinged, perfect centering in perfectly balanced margins, rich color. Superb, only five others at this choice grade. SMQ $1,400. Expertization: with 2013 P.S.E. certificate graded Gem 100. 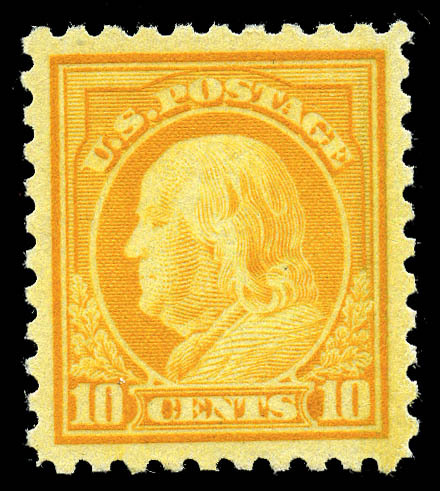 1922, 10¢ orange yellow, horizontal coil (497), joint line pair, original gum never hinged, beautifully centered, bright color. Extremely Fine, only nine have graded higher. SMQ $350. Expertization: with 1994 P.F. certificate and 2007 P.S.E. certificate, the latter graded XF 90.